True Fitness Solutions was started to address the fallacy, misinterpretations, confusion, and outright fraudulent claims to how our body’s adapt to exercise. The first word in our name TRUE refers to the trust that is needed to be able to learn. TFS success is from LEARNING what is best based on Exercise Science and having no fear of being committed to the continuous process of learning. Mike Craven has been running Mikes Olympic Gym for 30years here in Mechanicsville. Mikes Olympic Gym has produce 11 World Champions, 17 National Champions in the sport of power lifting. Learning how to display your maximum strength in power lifting is call absolute strength. This is measure by what you can lift 1 time. There have been many athletes from many different sports that have learned how this form of strength contributed to power production for their sport .Mike taught them the balance needed to train the Force Velocity curve in a year round fashion so what they learn in weight room could be more functional in playing there sport. Since 1993 Mike started a program call True Fitness Solutions that provided a service for members and non members that could show individuals how to train for the many other forms of strength which include( Absolute, Strength Speed, Speed Strength, Short term Endurance, and Aerobic Strength) .Practically applying Exercise Science could bring more reward for invested time spent exercising. Successful teams have coaches and athletes who are expected to give best effort, compete every day, make no excuses, learn from failures. This mind set, buy in, attitude, or culture change does not just have to be in sports. We can apply it to healthcare as well. True Fitness Solutions was started using these principles to fill in the black hole between Medical ( reactive) and what you choose to do to prevent( preventive) . Your Health is your greatest Wealth! You must compete for your health every day of your life. True Fitness Solutions thrives on competing What’s Best and Why. True Fitness Solutions is a program that offers a greater chance for achieving success long term in your fitness and health goals because of bringing Unity or buy in from your Health care team. True Fitness Solutions offers Exercise Science that’s put into action for each individual- though Exercise Prescription that your healthcare providers must agree with. Your Physician agrees diet and exercise is important to health and well being but most do not have a structure plan of Education, Evaluation and Exercise prescription. Very often when questions arise about prevention as it relates to exercise and diet, Physicians generalize their answers such as take the stairs versus the elevator. Some are even offering low cal diets like diet centers that inhibits the ability to become fit. Prevention is left up to individual. He or she must search for information related to good health. What is found is often inconsistent, can be misinterpreted, or can cause confusion. Some of the information is outright fraudulent. Sixty-one percent of America is overweight or obese. The Medical Profession (reactive) is treating many health risk factors related to weight such as High blood pressure, cholesterol, blood sugar, triglycerides, Diabetes, and Heart disease at a alarming rate. It is not just the sedentary but many that are trying to live an active lifestyle but don’t know they don’t know. So what’s needed for Physiological change does not happen. are opinion based versus evidence based. True Fitness Solutions would educate client to how a person’s muscles learn to use more fat for energy though increase Mitochondria development. Knowing this from Education means nothing if Exercise Program is not set up to accomplish it. Training the aerobic system as a measure Strength means with evaluations of Peak VO2 we can measure a person’s ability for aerobic energy production. Using this data to prescribe workout intensities, duration, and frequency we can prevent under training and overtraining. Using this data that is exact to individual current aerobic capacity is call( Exercise Prescription) which allows a positive adaption from increase in steady rates that increases the rate you can use fat for energy. Education- Exercise Physiology is the science of how our body’s respond to any model of exercise using the three energy systems. Education to what happens at the cellular level using the ATP-PC SYSTEM, The Lactic Acid system, and Aerobic system allows us to make the best choices for our health and fitness when exercising verses what is the latest trend or fad. Understanding what is evidence based and not someone’s opinion provides the solution for change. What at moment is a tradition must be replace if it’s in the best interest of everyone .Much of what can be proven is of little value without LEADERSHIP of others to support it. An example is Dr Kenneth Cooper of the Cooper Institute has been doing Vo2 testing for the measurement of health since the 1960s.How can today yet nine out of ten people have never been tested or understand its role as they age in prevention. True Fitness Solutions will provide you with the education that your Doctor will have to agree with. Evaluations- Peak Vo2, is number one evaluation that can indentify your level of Aerobic Strength. 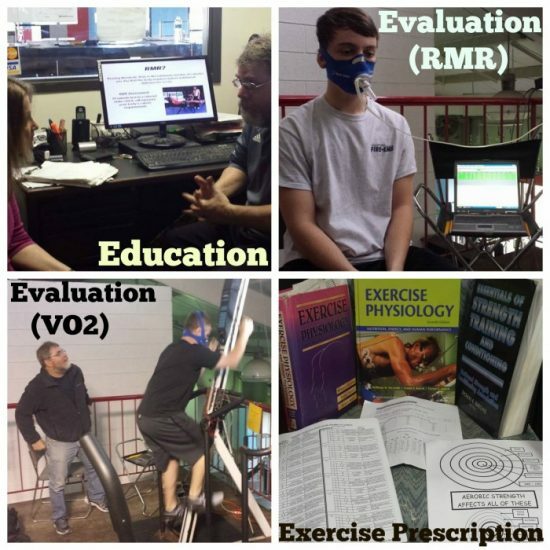 Peak Vo2 evaluations are not sufficiently discriminatory to how you chose to exercise. Exercise to far under the sweet spot or above the results are the same lack of adaption for invested time. Objective measurement of Peak Vo2 is to not be ignored no more than finding out you have high blood pressure. Whether you test low or high we have an understanding of your starting point . Using data from test results allows someone to train in manner of progressive overload with lower risk of overtraining and under training. Evaluations that are low bring awareness to a nesseatty to review why we should think of the aerobic system as a strength and what is the best manner to train for invested time to improve it. Exercise Prescription- is using data from Evaluation of Peak Vo2 that trains someone within their boundaries to challenge their energy system development. Workouts that provide challenge with workouts that allow overcompensation and not training by feel is what allows body to show a positive adaption to time spent exercising. Increases in positive adaption for 3,6,9,12 month periods comes the Physiological changes. The right mixture of Intensity , duration, and frequency of training causes Systematic changes. The lungs learn to process more air, the heart which is a muscle learns to pump more blood, the blood learns to carry more oxygen. More Capillaries develop per muscle fiber that supply more routes to get more blood to muscle. The muscles learn to extract more oxygen and increase the ability to use fat for energy, sparing glycogen. All these systematic changes came from a thought out plan describing improve health. There is no luck involve just take away reasons for failure.